It’s an exciting day. I’ve cracked open our first batch of humanure and it’s looking great! We started using our compost loo 18 months ago. Our toilet is a large bucket which sits within a wooden box with a toilet seat. Next to it there’s a container filled with spruce needles from the woods behind us, which form a cover and ‘soak’. They also filter out smells. The bucket is emptied into large composting bins which are very well insulated. This pile has been resting for 9 months. 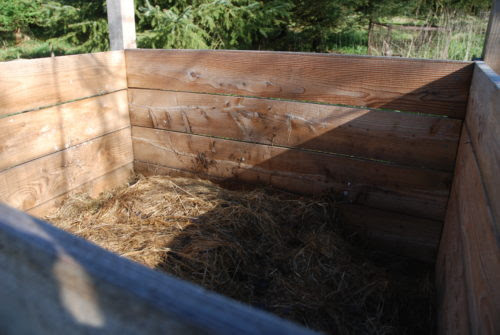 The compost is light and fluffy, with no recognisable poo and no unpleasant smell at all. It’s very similar to rotten horse manure and bedding. Want to know more about humanure? There’s more on compost loos – including James’ – on the Low Impact Living site here.